“Our objective is to prepare a diverse workforce to become leaders in the construction industry”, said Brian Wasserman, Chairman of the Construction Management program at Minnesota State University in Mankato. “To reach that objective, we’ve implemented Project Based Learning, and to successfully teach using Project Based Learning, we knew we needed to utilize the latest collaborative learning systems.” Project Management Learning is a variation of “Flipping the Classroom” where classroom time is no longer just lecture time. “The structure for most of the courses in our program is to have 4-5 students collaborating together in a small group to complete all of the necessary steps to document a construction project. These steps include activities such as bid review, safety risk management, hazard analysis, project management, and preparing schedules,” noted Wasserman. The Construction Management department partnered with Alpha Video & Audio to design and integrate collaborative learning systems that would support Project Based Learning. The classroom was reorganized away from rows of students facing one professor’s desk to seven student tables and one instructor station. The collaboration begins at the student tables. 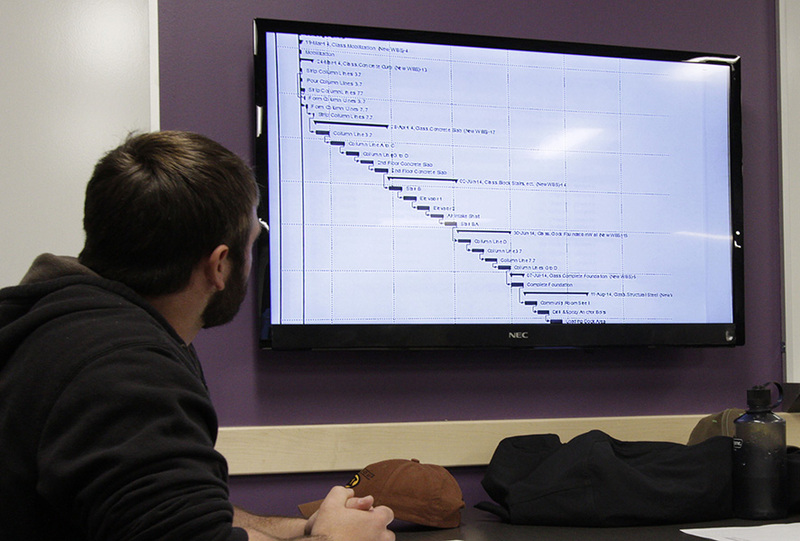 The students share a 40” monitor that is wall-mounted above the worktable. Student laptops are connected to the monitor through a Kramer Electronics HDMI switch. Once connected to the HDMI switcher, the students select the input to the monitor using a Kramer 8-button Room Controller pad. The result is that all students can work on separate steps of a project and easily share that data with other members of the group. 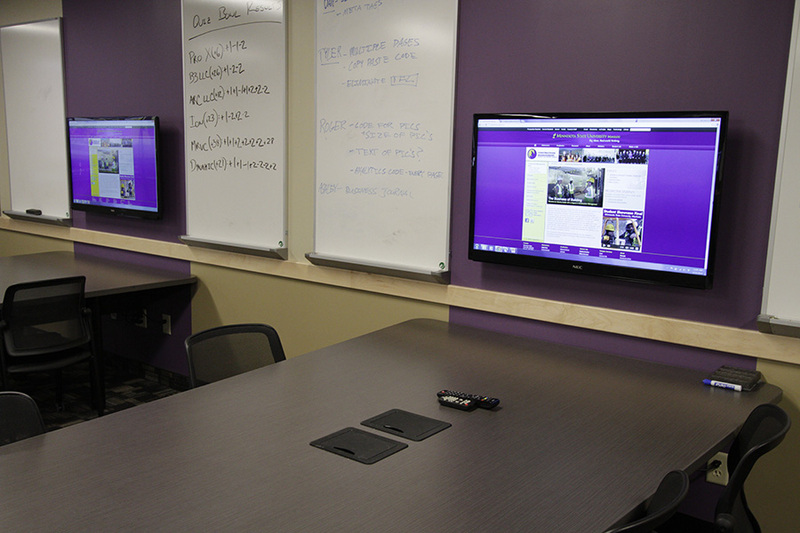 The additional classroom technology found at the instructor station is what really makes the classroom collaborate. The instructor controls the technology in the classroom using a Crestron DigitalMedia™ control system. The Crestron DigitalMedia system is capable of high quality uncompressed video resolutions that make viewing engineering drawings and detailed documents much easier, all through a single cable. Routing these high-resolution signals to multiple display types and resolutions is accomplished by using a Crestron DM scaling receiver. In addition to the 40” monitors, Alpha Video installed two Sony projectors and two Da-Lite 94” screen in the room so that data and images can be effectively shared with the entire classroom. By using the touch screen control panel, the instructor can display an image on any or all of the projectors and monitors in the classroom. For example, if a student has done an outstanding job on completing an assignment, the instructor can use the control panel to easily switch the data from the student’s laptop to displaying the data on both projectors and on all of the student monitors – with just one touch of the control panel. The instructor station includes a ceiling mounted Vaddio HD Document Camera so that the instructor can share hard copy documents with the students. This is essential for the construction industry since many reference and regulation documents are available in hard copy. 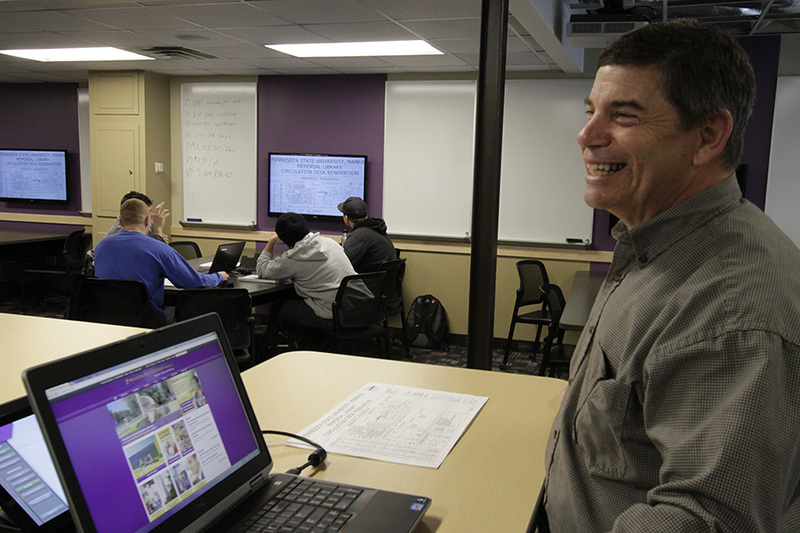 “The collaborative classroom is the future of higher education teaching,” stressed Wasserman. “No longer will a professor just stand in front of a class and lecture for an hour. Students are finding that working collaboratively in a small group is much more like the real work environment they will find after they graduate. Thanks to Project Based Learning and the collaborative systems installed by Alpha Video, we are preparing our students to be successful in the construction industry.